And so the Memebox story continues. 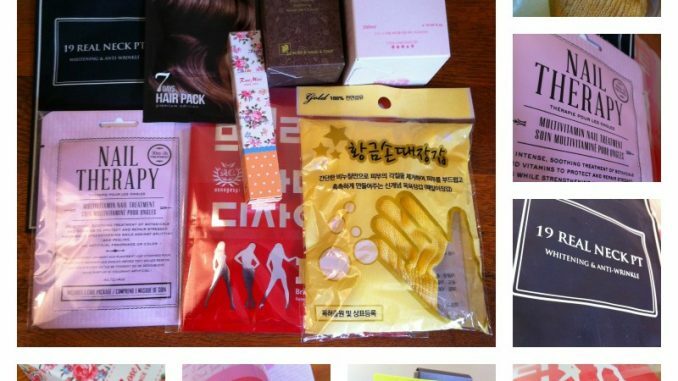 In case you’ve missed it so far, Memebox is a Korean company who produce just about the fabbest, best value beauty boxes around. It’s not a subscription, you just buy the boxes you like the sound of, and generally the contents have been pretty ace. But then – woe! – Memebox stopped shipping to most of the world that wasn’t Korea. Mucho wailing ensued. And then the wishes of beauty box aficionados around the world came true, and (almost) worldwide shipping was restored. 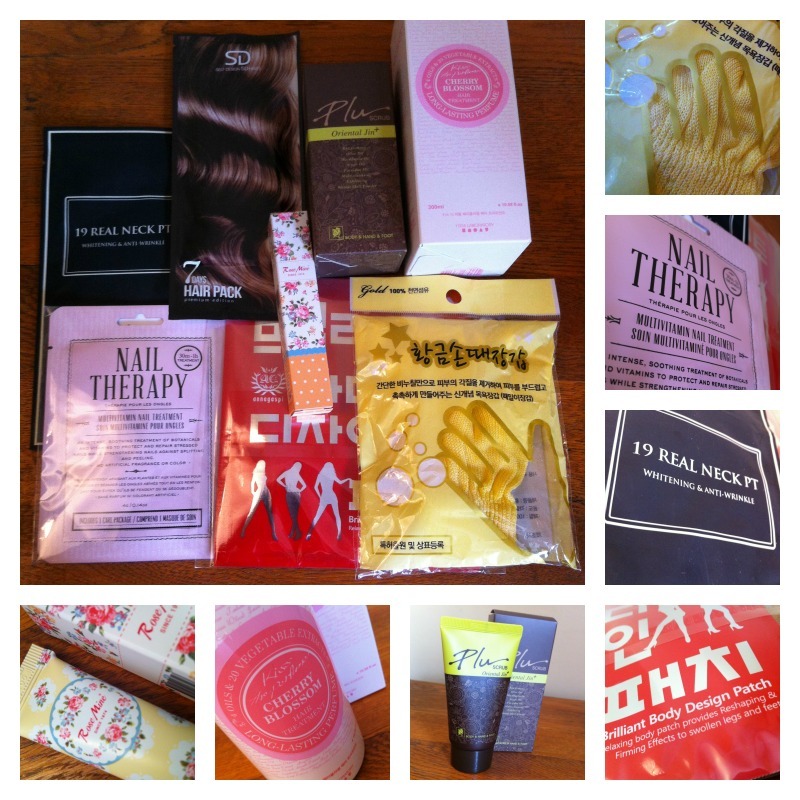 So I have been out to snare me some Memebox action, and this week the Hair & Body themed box and Luckybox #3 arrived. So we have 7 full sized products and one generous sample. I think this is a great idea. It’s like a face mask, but just for your neck. As Nora Ephron wrote I feel bad about my neck and I think all those of us over 40 know exactly what she meant. Contains fermented coconut juice, just what my neck has been waiting for. This gorgeously scented deep conditioning cherry blossom hair treatment is made from 4 natural oils and 20 vegetable extracts. Top of my daughter’s list to steal, and there’s no finer compliment. Now, you can buy exfoliating gloves for about £2 in Superdrug so unless these actually contain real gold I don’t see what makes them worth the inflated price. Still, it’s a useful thing to have with fake tanning season coming up. This is such a cute product with its pretty Cath Kidston-inspired packaging. It’s a perfume in the form of a sparkly gel – never seen that before. Lovely floral fragrance and probably also destined to be stolen by teenage daughter. This body scrub contains an impressive range of ingredients including olive, macadamia and argan oils, plus red ginseng. Well, it’s all going on in there. I used this today and it has a great texture, like finely milled sugar. This is my least favourite product in the box. Apparently it’s “a hydro-gel body patch that reshapes and firms swollen legs and feet”. Come on now, no patch is going to reshape your legs. Only a meat cleaver or plastic surgery can do that. And on that bombshell, we examine Luckybox #3. 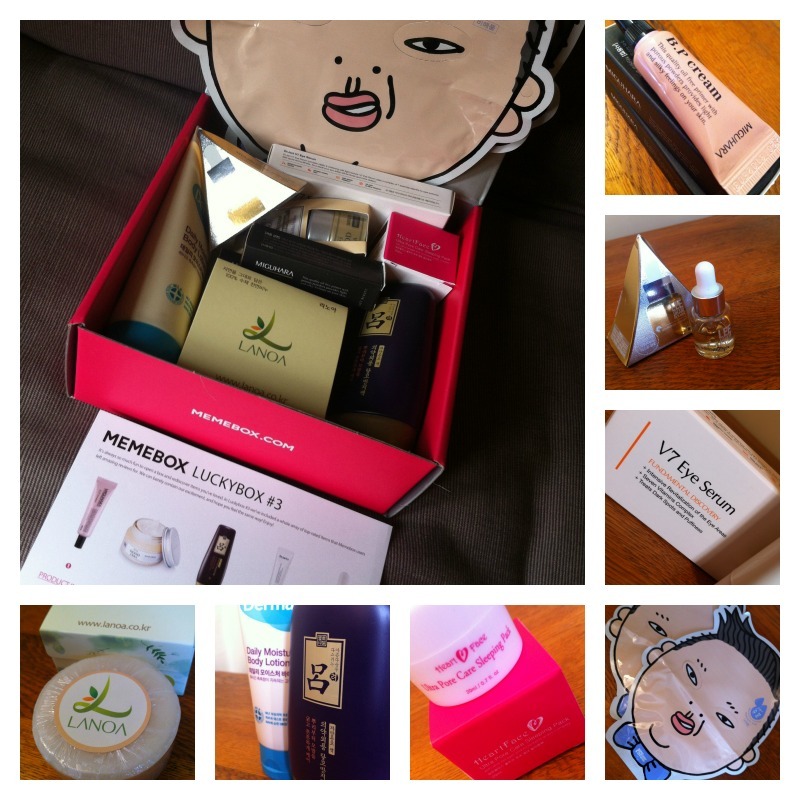 Memebox Luckyboxes are comprised of products which have already been in previous Memeboxes, so they are a good choice if you’ve not bought a box before. Despite its scary sounding name, hyaluronic acid is great for moisturising. And the packaging looks like Psy of Gangnam Style fame. I think this means you need to prance around the room when you’re wearing it. I certainly will be. A multi-tasking product combining primer and BB cream. Tiny samples but handy for handbags. I don’t need an anti-hairloss product – if anything I have too much hair. This is an intense conditioning treatment so I’ll give it a go and maybe grow some extra hair to sell on eBay. Now this I can use. This eye serum contains 7 vitamins to keep your peepers peeping wonderful. This promises to increase your facial luminosity which is perhaps not so good if you have a big moonface like me. If I become any more luminous astronauts will try to land on my cheeks. Basically, it’s a posh soap. Apparently you can use this on your face as it’s full of gentle, natural ingredients but I think I will be keeping this one for the shower. Packaging-wise this looks less than exciting and more like something you would pick up in the supermarket. But the little people who live in my internets say it’s good so I’ll keep an open mind. Sleeping Pack seems to be the Korean term for night cream. This is a gel-like moisturiser which promises to ensure that you rise from your beauty sleep looking extra-beautiful. Cost of box is $29.99 including shipping, around £17 in total. I had some points and discounts so I paid a bit less for the Luckybox, around £12. Shipping took 11 days from dispatch in Korea to arriving into my grubby paws in the UK. Packaging is in pretty and sturdy pink boxes – all my boxes have arrived in perfect condition. All in all I am very pleased with these boxes, apart from the body patch and even that I’m willing to have a go with. It’s a great mix of innovative, practical products, brands not available in the UK and cutesy packaging. And now I have an exciting time coming up working out how many of these products I can use at once. Memebox, it’s good to have you back. Are you a Memeboxer? What do you think of these boxes?